enables customers to link directly to Tranter's website and view the electronic Installation and Operation Manual (IOM). This will allow all customers to simply scan the code and view their appropriate IOM without having to dig through paper files. This QR Code says Tim McDonald, Director of Sales & Marketing, "will help customers get the information that they need faster. With a scan of the QR Code, customers can open a digital version of the IOM and see much needed information for servicing their heat exchanger. Such as instructions for replacing gaskets, cleaning the plates and contact information for the nearest Tranter service center. The QR Code provides a simple way for customers to utilize mobile devices to directly deliver the IOM in their hands with one click." USA Plant Offers Quick Ship Plate & Frame Heat Exchanger Program . 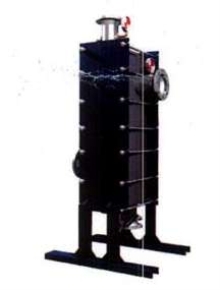 Heat Exchanger utilizes all-welded plates.